NEW ORLEANS – Movement has been centralized in the NCAA Division I Men’s Cross Country Regional Rankings so far, but we’re beginning to see it branch out a bit as the season progresses. This past weekend teams from across the nation took part in the Coast-to-Coast Battle in Beantown and the Roy Griak Invitational and because of that, there were some changes to the Week 3 rankings that were released Monday by the U.S. Track & Field and Cross Country Coaches Association (USTFCCCA). Wisconsin isn’t about to let go of its No. 1 ranking in the Great Lakes Region. Indiana and Michigan State, however, continue to play “Hot Potato” with the No. 2 ranking. The Spartans leapfrogged the Hoosiers and took over the No. 2 spot behind the Badgers after a strong performance at the Roy Griak Invitational. Michigan State finished a close runner-up to team champion Colorado State (47-55) in Falcon Heights, Minnesota, while Indiana finished a very distant third at the Coast-to-Coast Battle in Beantown. Eastern Michigan and Michigan rounded out the top-5 in fourth and fifth, respectively. Nothing changed from No. 1 to No. 10 from Week 2 to Week 3. Georgetown remains No. 1 and is followed by No. 2 Navy, No. 3 Princeton, No. 4 Penn and No. 5 Penn State. We should many – if not, all – of those teams in action this weekend at the Paul Short Run. Illinois moved up to the No. 2 spot behind No. 1 Oklahoma State this week. The Illini finished a game runner-up to Syracuse as the Coast-to-Coast Battle in Beantown thanks to the individual efforts of Jesse Reiser and Jonathan Davis. Reiser and Davis went 1-2 at Franklin Park with Reiser earning the first XC win of his collegiate career. Iowa State dropped to No. 3 and is followed by No. 4 Tulsa and No. 5 Minnesota. There will be a time that the top-5 in the Mountain Region changes. Week 3 is not that time. Northern Arizona is still No. 1 with No. 2 Colorado and No. 3 BYU close by. Next up behind the Lumberjacks, Buffs and Cougars is No. 4 Southern Utah and No. 5 Colorado State, which won the team title at the Roy Griak Invitational this past weekend. Syracuse debuted most of its top guys this weekend at the Coast-to-Coast Battle in Beantown and excelled. The top-ranked Orange put three runners in the top-5 and all five scoring athletes in the top-15 on their way to a 35-point performance. Columbia and Iona are No. 2 and No. 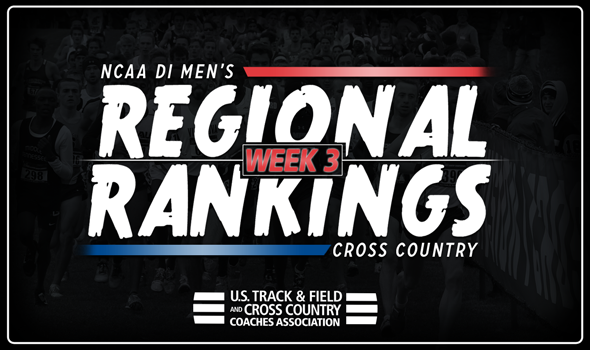 3 for the second week in a row, while Cornell and Brown both moved up one spot to round out the top-5. Middle Tennessee State sits No. 1 for the third week in a row. Following in order behind the Blue Raiders is No. 2 Ole Miss, No. 3 Alabama, No. 4 Florida State and No. 5 Georgia Tech. It’s Arkansas, Texas and then anybody’s guess in the South Central Region. The Razorbacks and Longhorns come in ranked No. 1 and No. 2 for the fourth week in a row, but behind them it is wide open as Texas A&M and Baylor climbed higher into the top-5 and McNeese State jumped seven spots from No. 12 to No. 5 after a great showing at the Texas A&M Invitational this past weekend. Furman is still the team to beat in the Southeast Region. No. 2 Virginia made a strong case this past weekend as it won the Panorama Farms Invitational over No. 6 Campbell. Virginia Tech is No. 3, followed by No. 4 NC State and No. 5 Eastern Kentucky. That’s what changed in the top-5 of the West Region. Stanford is No. 1, Oregon is No. 2, Washington State is No. 3, Portland is No. 4 and UCLA is No. 5. Only the Bruins competed this past weekend and finished third at the Roy Griak Invitational as Garrett Reynolds and Robert Brandt placed second and third overall, respectively.